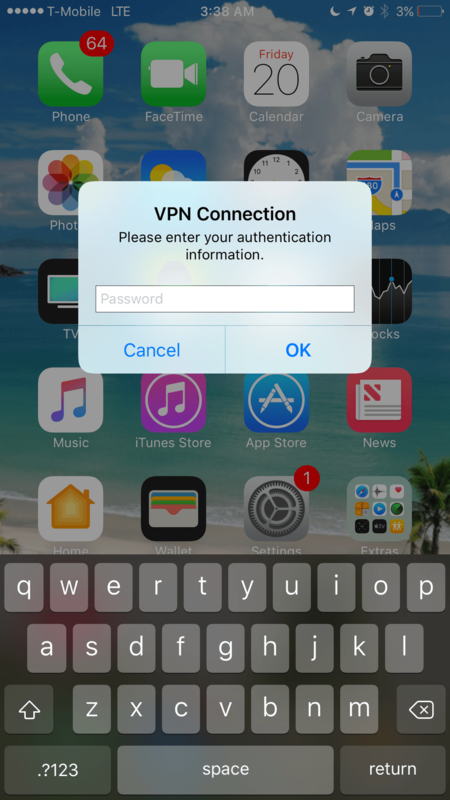 This Operating System dialog may appear if your iOS device was turned off while you were connected to VirtualShield VPN. This is a completely standard popup, all you have to do is tap Cancel and the VPN connection will automatically re-connect, allowing you to continue to use your device normally. If the message keeps appearing after pressing Cancel, you may need to tap it repeatedly 3-4 times until it closes. Another suggestion is turning on Airplane Mode, then removing the iOS app and re-installing it. To prevent this popup from appearing in the future, just disconnect from our servers first before you turn off/restart your device.